I have a keen interest in drifting FADs (dFADS), and I mean everything about them: design, technology, monitoring, operation, functioning, materials, management, and so on… truth is that presently the tuna canned industry depends totally on them, “FAD free” alone will not maintain the present fleet numbers and supply volumes (not arguing that this is good thing at all! ), yet “banning FADs” is rather utopic. So we are stuck with them, and I find it almost bizarre that for a “tool/gear” that the canned tuna industry totally depends on, we still understand very little about them. Don’t get me wrong, fishing masters know a lot about FADs (and I love that the authors of the paper seems to have spent a lot of time talking to them), yet is all based on personal experiences and preferences. And as anything else in fisheries is very dependent on where and who with, as a fisher, you learn your trade. Different fleets and sometimes different fishing masters in the same fleet, do the same thing in different ways. One of the key criticism for FADs is the levels of bycatch, hence knowing the dynamic of fish species appearing underneath the FAD over time can help mitigate to an extent the issue. While the present generation of sonar buoys is getting better by the month in differentiating on the composition of the schools underneath, having an understanding of the non tuna to tuna “progression” does helps a lot. As always read the original “Aggregation process of drifting fish aggregating devices (DFADs) in the Western Indian Ocean: Who arrives first, tuna or non-tuna species?” (free access), I will just quote here the abstract and the conclusions. Floating objects drifting in the surface of tropical waters, also known as drifting fish aggregating devices (DFADs), attract hundreds of marine species, including tuna and non-tuna species. Industrial tropical purse seiners have been increasingly deploying artificial man-made DFADs equipped with satellite linked echo-sounder buoys, which provide fishers with information on the accurate geo-location of the object and rough estimates of the biomass aggregated underneath, to facilitate the catch of tuna. Although several hypotheses are under consideration to explain the aggregation and retention processes of pelagic species around DFADs, the reasons driving this associative behavior are uncertain. This study uses information from 962 echo-sounder buoys attached to virgin (i.e. newly deployed) DFADs deployed in the Western Indian Ocean between 2012 and 2015 by the Spanish fleet (42,322 days observations) to determine the first detection day of tuna and non-tuna species at DFAD and to model the aggregation processes of both species group using Generalize Additive Mixed Models. Moreover, different seasons, areas and depths of the DFAD underwater structure were considered in the analysis to account for potential spatio-temporal and structure differences. Results show that tuna species arrive at DFADs before non-tuna species (13.5±8.4 and 21.7±15.1 days, respectively), and provide evidence of the significant relationship between DFAD depth and detection time for tuna, suggesting faster tuna colonization in deeper objects. For non-tuna species, this relationship appeared to be not significant. The study also reveals both seasonal and spatial differences in the aggregation patterns for different species groups, suggesting that tuna and non-tuna species may have different aggregative behaviors depending on the spatio-temporal dynamic of DFADs. This work will contribute to the understanding of the fine and mesoscale ecology and behavior of target and non-target species around DFADs and will assist managers on the sustainability of exploited resources, helping to design spatio-temporal conservation management measures for tuna and non-tuna species. Many studies have investigated the behavior of tuna [22, 36, 47–51] and non-tuna species [29, 32] at different spatio-temporal scales around FADs but few of them have investigated the aggregation process of species in detail [4, 24, 34, 52]. 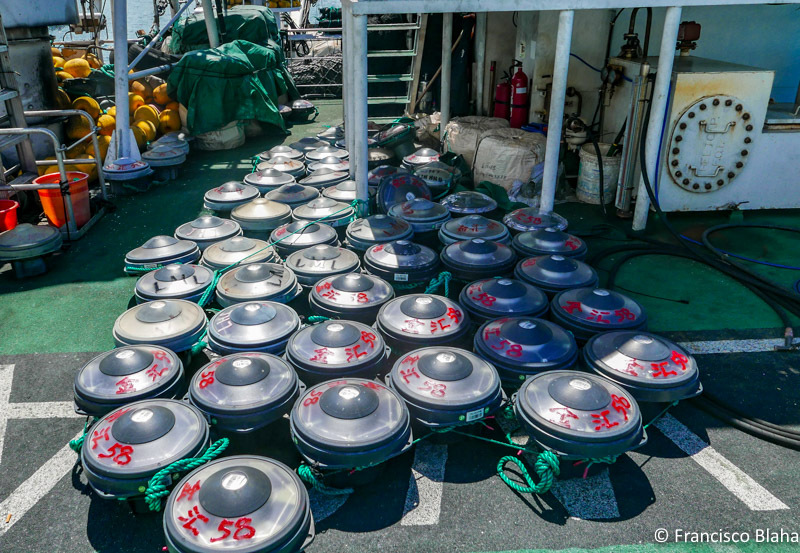 This is the first-time, to our knowledge, that fishery independent data provided by fishers´ echo-sounder buoys have been used to explore at a fine- and meso-scales the aggregation processes of species at virgin DFADs in the Indian Ocean. The effect of the DFAD depth was assessed in relation to the first detection day and the aggregation dynamics, finding significant differences for tuna and not-significant effects for non-tuna species. The aggregation dynamics of tuna and non-tuna species generally showed an increasing trend during the first 30 days after deployment, but also showed specific seasonal and area differences per group. These differences suggest that tuna and non-tuna species may have different associative behaviors. In recent years the potential use of DFADs as scientific platforms has been highlighted by the scientific community [26, 27]. Indeed, echo-sounder buoys represent a very powerful tool to continuously and automatically collect and stream information on thousands of DFADs in a very cost-effective manner. Considering that around 100,000 objects may be deployed annually worldwide [37, 53, 54], these devices can provide acoustic data on the biomass of tuna and non-tuna species underneath them from all tropical oceans on a regular and effective basis. Fishers echo-sounder buoys have been very useful for the investigation of the aggregation process of tuna and non-tuna species at DFADs, so these data could also allow scientists to better assess several issues of scientific relevance related to DFADs, for example they could investigate the spatio-temporal distribution in relation to environmental parameters or could produce a fishery independent abundance index for stock assessment , among others. The echo-sounder buoys used in this study provide a single biomass value without determining the species or size composition of the fish underneath the DFAD. Tuna are well known to engage in both horizontal and vertical movements around DFADs [51, 56–58] and, although overlap may exist in the vertical range of the three species of tuna, tagging data suggest differences in depth preferences between the species and the different sizes of these species. Skipjack tuna schools tend to remain in shallower waters, as do small yellowfin and bigeye tuna that are found occupying similar depth ranges as skipjack. However large individuals of bigeye and yellowfin tuna are found at greater depths. This potential segregation has also been observed in the Indian Ocean by dedicated surveys around DFADs using scientific echo-sounders . In addition to this segregation by species and sizes, the vertical distribution of tuna at DFADs may vary depending on different factors, including oceanographic conditions (e.g. thermocline depth or surface and subsurface currents) [51, 56], total associated fish biomass or number and size of species present at DFADs . Recent acoustic research  has found a different frequency response for skipjack compared to bigeye and yellowfin tuna when analyzed simultaneously using multiple acoustic frequencies, based on anatomical differences (i.e. the skipjack does not have a swim bladder while bigeye and yellowfin tuna do). Incorporating multi-frequency technology in echo-sounder buoys could help in more effective tuna species discrimination at DFADs, with obvious advantages for science and management. Having specific composition information before the fishing set could help to mitigate, for example, the catch of small bigeye, which is one of the most important concerns associated with DFAD fisheries in tunaRFMOs , thereby contributing to a more sustainable exploitation of the resources. Future studies should consider improved methodologies and buoy technologies to effectively discriminate between the three species of tropical tuna so that species-specific aggregation processes can be better understood. In addition to this spatial competence by tuna species and sizes, overlap may also exist between tuna and non-tuna species that occupy different depth layers depending on the time of day or the area. To take this consideration into account, several options were considered during preliminary analyses to choose the time at which the acoustic signal is more representative of the biomass around the DFAD. For example, model the diel biomass estimated by the echo-sounder using general additive models and choose the maximum biomass value between the peak hours. Another option was to choose the sample with maximum biomass value around sunrise (between 3 a.m. and 8 a.m.), since this is the time when tuna and other species are supposed to be more closely aggregated under the DFADs [60–63]. However, due to sampling constraints (i.e. sampling frequency is not hourly), using these options would considerably limit the number of samples available in this study. Future studies with more data should consider the use of the above-mentioned options and compare results with current findings. Also, the position of the fish in relation to the echo-sounder beam and its detectability is something to be considered. Some bycatch species are known to be more strongly and tightly attached to the DFAD (intranatant/extranatant species, see ) than tuna species (circumnatant) and thus, may be more easily detected. Besides, some species like tuna make longer excursions out of the DFAD when compared to most non-tuna species [24, 31, 34]. However, the cone shape of the beam of the echo-sounder, with a larger area with increasing depth, compensates the detectability of tuna individuals. Ideally, future studies should combine echo-sounder buoy sampling around DFADs with dedicated tagged and monitored fauna to infer detectability rates per species and size and assist in acoustic signal interpretation. Our research shows that, in general, the average first detection of fish at DFADs occurs at around 1–2 weeks (~12.2±7.7 days). Previous studies in the field have shown different results. Some works observed a faster colonization of DFADs by tuna, generally in less than a week  while others have suggested similar aggregation periods. For example, fishers working with anchored FADs (AFADs) in the Philippines wait 11 days after the first deployment before checking for biomass aggregation . AFADs may be easier to detect and colonize as they are fixed reference points located in areas close to the coasts. In general, the first group to be detected by the echo-sounder appear to be the tuna. Some authors, based on interviews with fishers and other investigations, have stated that non-tuna species may arrive first at DFADs [1, 4, 23]. For example, fishing masters of the purse-seine fleets working in the Western Indian Ocean suggested that 1–3 weeks are necessary to colonize virgin DFADs by non-tuna species . However, for tuna, half of them said that aggregation process may not be time-dependent, and the other half said that at least one month is needed. Our results, using fishery-independent data from continuously monitoring DFADs since their first deployment, showed that this time may be shorter than expected. A possible explanation for this is that at the time of the interviews (i.e. 2007) they had just started working extensively with DFADs equipped with echo-sounders and, hence, were not able to accurately interpret echo-sounder buoy information in general, and in particular related to the aggregation process. Another possible explanation is that non-tuna species may be easier to observe than tuna when fishers approach the object, as non-tuna species are strongly associated with DFADs  showing less frequent excursions out of DFAD [23–25, 34]. Future studies should consider consulting fishers again on this issue in order to determine whether their beliefs have changed through time due to the extensive use of these technological devices or fishing strategy changes. Indeed, fishing strategy changes may have been occurring in recent years in the Indian Ocean (i.e. smaller soak times before first setting) to try to reduce the potential steal rate of DFADs, and consequently, catches. Although our results for the first detection day slightly differ from some of the previous works, the differences could be partially explained by the minimum detection threshold of around one ton that buoys have. If the amount of fish aggregated under the DFADs is lower than one ton (as for the conversion done by the manufacturer) during the first few days the object is at sea, the echo-sounder may not be indicating biomass presence, potentially biasing the analysis. This limitation may be significant in the case of non-tuna species, since bycatch species are normally found in lower amounts than tuna species at DFADs (i.e. in a range between 1–5 tons [25, 66, 67]).However, we do not expect this to have implications for the final results as tuna usually swim in large schools .Moreover, Satlink buoys use a method that converts raw acoustic backscatter into biomass using an empiric algorithm based on the target strength and weight of skipjack tuna, which is the main target species of the DFADs’ purse seine fishery. Whereas the skipjack tuna does not have a swim bladder, the majority of bycatch species do. Swim bladder species normally produce a much higher echo than bladderless ones since this hydrostatic organ, when present, is responsible for 90–95% of the backscattering energy . Accordingly, one ton of the skipjack-based algorithm biomass may not necessarily represent the same amount of non-target species, but probably less, and thus the one ton threshold may not weaken the results and conclusions of this work. Still, it would be very useful to be able to work without this detection threshold. To overcome this, there is a need to propose collaborations between buoy companies, fishers and scientists to develop a process for a routine, continuous, confidential and RFMO-supported raw data transfer, with reasonable delays, between the purse seine industry and research centers. Access to these raw data would provide scientists information without the threshold limitation, which could help in the investigation of sustainability and the management of the exploited resources. DFADs’ characteristics can vary between fleets and oceans but in general they are composed of a raft and an underwater part hanging below the object [2, 70]. The depth reached by the structure ranges from 15 to 80–100 meters and is ocean-specific (15-20m in the Indian Ocean, 80-100m in the Atlantic Ocean and around 30m in the Eastern Pacific Ocean) , although in recent years a trend toward deeper objects in all the oceans has increased . The study has suggested a significant relationship between object depth and faster tuna aggregation. For non-tuna species, on the contrary, this relationship appeared not to be significant. These differences may be related to the vertical distribution of the species under DFADs. As non-tuna species usually occupy shallower waters (<25 meters)  the depth of the underwater part may not affect their detection ability, and consequently, the aggregation process. It may happen, however, that the shape or material of the floating part would be more important than the hanging structure in the aggregation of non-tuna species. Similar works should study non-tuna species aggregation process differences on DFADs with different features of the floating structure. By contrast, tuna are usually found in deeper waters (i.e. > 25m) [34, 50, 51, 72, 73], and thus, deeper objects might be easier to detect visually. Indeed, the eye is considered the main sense organ of tuna which is better adapted to low light [74, 75]. However, other senses may also help in detecting the object (e.g. sound, chemical) [76, 77]. Although the results of this study may suggest that the depth of the underwater structure could play an important role in the aggregation of tuna at DFADs, further studies should investigate in detail the aggregation-segregation phenomenon in relation to sensory cues, as understanding the key drivers of the associative behavior is crucial for the adequate management of exploited resources. During the first 30 days of the object at sea, the tuna biomass follows the same biomass increasing trend for both DFAD depth categories. However, from that point onwards, there is a decrease of the tuna biomass in deep DFADs. The reasons causing the loss of tuna biomass in deeper objects after the first month are difficult to determine, as there is little evidence and information on the factors driving fish to leave the DFAD. Several hypotheses have been generated by the scientific community to explain why tuna and non-tuna species associate with DFADs [1, 6, 7] but none to elucidate why fish leave them. The interviews conducted by Moreno et al. (2007) with fishers in the Indian Ocean, pointed out a change in the speed or direction of the drifting object, the presence of large predators, or DFADs entering the continental shelf as the main reasons for fish to leave a DFAD. Future research should combine echo-sounder buoy data along the trajectory of the object with environmental information to investigate the drivers of biomass dynamics around DFADs. To our knowledge, this is the first time that the depth of the net hanging down has been related to the aggregation process. So far, the effect of the depth has been investigated in relation to the tuna catch species composition. Lennert-Cody and Hall  and Lennert-Cody, Roberts  found that the species composition of the catch varied with the depth of the net hanging down, suggesting there could be more successful bigeye and yellowfin sets on objects with deeper structures in the Eastern Pacific Ocean. However, similar works in the western Pacific Ocean  did not find such a positive relationship for bigeye tuna. Related to these investigations, the Inter-American Tropical Tuna Commission considered the possibility of limiting the depth of the underwater part hanging below the FAD  in order to reduce the bigeye bycatch, although the measure was not ultimately adopted and it is not being implemented by the fleet. Therefore, since in this study we have found evidence that the depth of the object’s underwater part affects the aggregation of tuna, further studies should be proposed to help to design specific management measures for tuna species. The large quantity of data available for this work (42,322 daily biomass observations) provides a high spatio-temporal resolution to study the aggregation process across different seasons. The Indian Ocean is characterized by strong environmental fluctuations associated with monsoon regimes that affect ocean circulation and biological production . Changes in biophysical factors associated with seasonality (i.e. chlorophyll, temperature, salinity, dissolved oxygen) may play an important role in the aggregation dynamic of tuna and non-tuna species. Our first detections were consistent for all the monsoon periods analyzed (i.e. tuna were always detected earlier than non-tuna species at DFADs). The first detection days of tuna species at DFADs were statistically different across seasons, with a maximum difference of 2.5 days. Despite this result, when the analysis was made between seasons, we only found differences for arrival time among the winter monsoon and summer monsoon and autumn intermonsoon periods. In relation to the aggregation dynamics, the maximum biomass is reached later (i.e. after 40 days at sea) in summer and autumn periods in comparison to other seasons. These differences may be related to changes in productivity between periods. A strong upwelling occurs in the Western Indian Ocean in the summer monsoon season , where cold and highly saline waters with a high nutrient content are pumped up, producing an increase of primary production along the coast of Somalia [83, 84] which can spread more than 500 km offshore . This productivity increase may make floating objects less attractive for tuna as enough prey concentration may be available in the surface environment. On the other hand, productivity is significantly lower during the winter monsoon , where not only both tuna and non-tuna species arrive earlier at the DFADs in comparison to other seasons, but the biomass also peaks earlier compared to the summer and autumn periods. It is known that the distribution of large predators, like tuna, is affected by productivity , but the relationship between productivity and DFAD attractiveness remains unclear. This work hypothesizes that productivity and DFAD attractiveness may be inversely related. Future research at different spatio-temporal scales should link acoustic information with remote sensing variables, including chlorophyll-a, to analyze whether, and how, environmental conditions are related to the aggregation dynamics of tuna and non-tuna species at DFADs. It is important to highlight the different trends that have been observed in the SE Seychelles from December to April-May, while for the rest of the year all areas showed similar trends. During the winter monsoon the fishery is usually located in the SE Seychelles and Chagos areas in search of FSC , where schools of yellowfin and bigeye tuna happen to be feeding or spawning in surface waters . The difference in the observed aggregation dynamics in the SE Seychelles area coincides with the FSC fishery season, which could affect the species composition in the area and, hence, the aggregation dynamics around DFADs. In addition to environmental features, other factors could also affect the aggregation process of tuna and non-tuna species at DFADs, such as the density and abundance of the population and of the DFADs. Robert, Dagorn  suggested that social interactions underlie aggregation processes. Because tuna biomass seems to increase after the deployment of a DFAD, we could interpret this to mean that tuna associative behavior may be dependent on fish density , and thus, an increasing abundance of fish at DFADs could lead to stronger attraction and retention behaviors . Moreover, an overall saturation point observed after approximately 30–40 days may indicate that after a certain specific period, the aggregation of tuna could be compromised. Therefore, DFADs could contribute to the formation of large schools and the optimal school size  during the first 30–60 days at sea. Fishing around DFADs has become the main strategy used by tropical tuna purse seiners in recent years . The concern surrounding DFAD fishing generally comes from the uncertainty about the impacts it produces (e.g. a higher level of bycatch, alteration of tuna movements, impacts on the habitat, etc.). To consider new and alternative management options, it is necessary to improve our knowledge of the key factors driving the species aggregation-segregation processes with floating objects. This study contributes to better understanding of the tuna and non-tuna aggregation mechanisms in relation to both the DFAD structure and deployment seasons. In summary, the first detection day of fish at DFADs was around 1–2 weeks and differed significantly between tuna and non-tuna species. Although fishers consider that deeper DFAD may favor faster and larger fish aggregations , this aspect has never been investigated in detail in relation to the aggregation processes. The analysis showed a significant relationship between object depth and colonization of tuna, suggesting a faster tuna colonization for deeper objects. For non-tuna species this relationship appeared not to be significant. The Indian Ocean is characterized by strong environmental fluctuations associated with monsoon regimes and seasonal variability in fishing grounds  and catch . Therefore, analyzing the aggregation process in different periods could help with designing spatio-temporal management measures for tuna fisheries. The aggregation dynamics differed between monsoon periods in both tuna and non-tuna species. These differences could be explained by changes in the biophysical environment associated with seasonality, although there may be other social factors affecting the aggregation process of tuna and non-tuna species at DFADs, such as the density and abundance of the local tuna population or DFADs. The results of this research can be used to assist in working for the sustainability of tuna fisheries and may help to design management measures for tuna and non-tuna species, such as optimization of fishing activities.